What was the best play of 2016? We ranked the top 30. What was the best play of 2016? It's hard to narrow it down to 30, but we did that. It's even harder to rank those 30, but we ranked them anyway. The bar was somewhat high, the selection process highly unofficial and the list, hopefully, no less enjoyable to relive. You can watch all 30 of our top plays below. Farewell, 2016. Here's to an even more epic 2017. Prescott, a fourth–round pick in 2016, has his name in the MVP running after assuming starting quarterback duties from an injured Tony Romo before the season. Prescott has the Cowboys looking like a Super Bowl contender. The former Mississippi State quarterback has 3,630 yards, 23 touchdowns and just four interceptions to his name through 15 games. Biles was known among the “Gymternet” for her World Championship exploits between 2013 and 2016. She became a household name in Rio, winning gold medals in the women's vault, women's team all-around, women's floor exercise, and women's individual all around. It was a near-perfect trip to Rio, as she also won a bronze in the women's beam. Pulisic, who turned 18 in September, has put together a historic 2016. He became the youngest foreigner to score a goal in the Bundesliga as well as the youngest to score a goal for the U.S. men's national team. He regularly features in Dortmund's Starting XI, even against European giants like Real Madrid. McDavid is the youngest captain ever in NHL history at just 19 years old. The Oilers forward posted 16 goals and 32 assists during his rookie season, which was just 45 games. McDavid has been a star this season—through 36 games, he had 13 goals and 29 assists. Jackson was one of the most entertaining players to watch in college football in 2016. The Louisville quarterback finished the year with 3,390 passing yards, 1,538 rushing yards and 51 total touchdowns. He was awarded the 2016 Heisman Trophy award. Antetokounmpo turned 22 in December and recently cashed in by signing a four-year $100-million contract extension. He averaged 17.2 points, 7.8 rebounds and 4.4 assists last season and has taken onto his role as the Bucks point guard. Ledecky left London in 2012 with just one gold medal, but in subsequent years she started rewriting the record books. She returned to the Summer Games in Rio de Janeiro to win gold medals in the 200-, 400- and 800-meter freestyle races and in the 4x200-meter relay. She broke her own world records in the 400- and 800-meter races. Ledecky also took silver in the 4x100-meter freestyle relay. Now she’s at Stanford to put her name all over the NCAA record book. NHL teams passed Panarin over in the 2010 draft, but he signed an entry-level contract with the Blackhawks in the summer of 2015 after six years in the KHL. He scored 77 points in his first season stateside, best among rookies, and earned the Calder Award as the league’s top rookie. Sanchez may not have come away with the Rookie of the Year award but he helped the Yankees remain in the playoff picture with 20 homers in 53 games last season. Kerber, who turned 28 in January, unexpectedly emerged as the top rival to Serena Williams in 2016, ultimately dethroning Williams atop the WTA rankings and earning WTA Player of the Year honors. Keber won the Australian Open and the U.S. Open, and she was a finalist at Wimbledon. She earned a silver medal at the Rio Olympics. Matthews was a highly touted prospect entering the NHL, and the Maple Leafs center lived up to the hype in his league debut, scoring four goals against the Ottawa Senators. Through 33 games played, he had 16 goals and 10 assists. Once a quarterback and now a reliable receiver, Pryor has taken to his new position and provided one of the lone bright spots on a winless Browns team. Through the first 15 games of the season, he had 70 catches for 977 yards and four touchdowns. Karl-Anthony Towns already broke out as a rookie last season but has elevated his game to average 22.2 points, 11.3 rebounds and 1.4 blocks per game as of Dec. 27. The Timberwolves center is starting to look like a player that could win an MVP award in the near future. Michigan’s defense has played a critical role in the team knocking on the door of the College Football Playoff, and Peppers emerged as the team's star. In 2016, he recorded 72 tackles, including 16 of them for a loss. He averaged 14.8 yards a punt return. He also carried the ball 27 times for 167 yards and three touchdowns. He finished fifth in Heisman voting. Stewart was a stud at Connecticut, but her stock continued to rise when she entered the WNBA this past season. 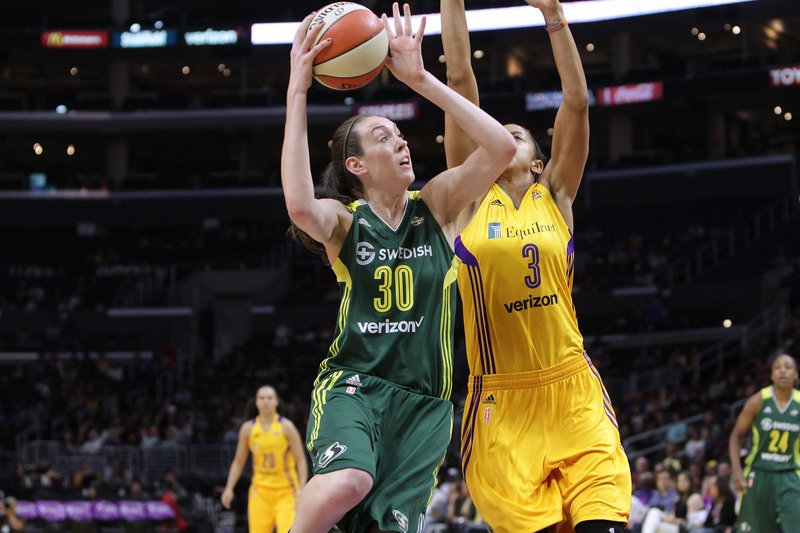 Stewart won Rookie of the Year honors after averaging 18.3 points, 9.3 rebounds and 1.9 blocks for the Seattle Storm. She led her team to the postseason for the first time since 2013. His first year with Boston was a forgettable one as he finished 2015 at 9-15 with a 4.92 ERA. He rebounded by leading the majors with 22 wins, posting a 3.15 ERA over 33 starts and winning the AL Cy Young award. Centrowitz a 108-year drought when he won the first U.S. gold medal in the men’s 1,500 in a very tactical final in Rio de Janeiro. In just 73 games, Turner proved that he will be part of the the Nationals lineup for years going forward. He hit .342 with 13 home runs, 33 stolen bases and an OPS+ of 144. 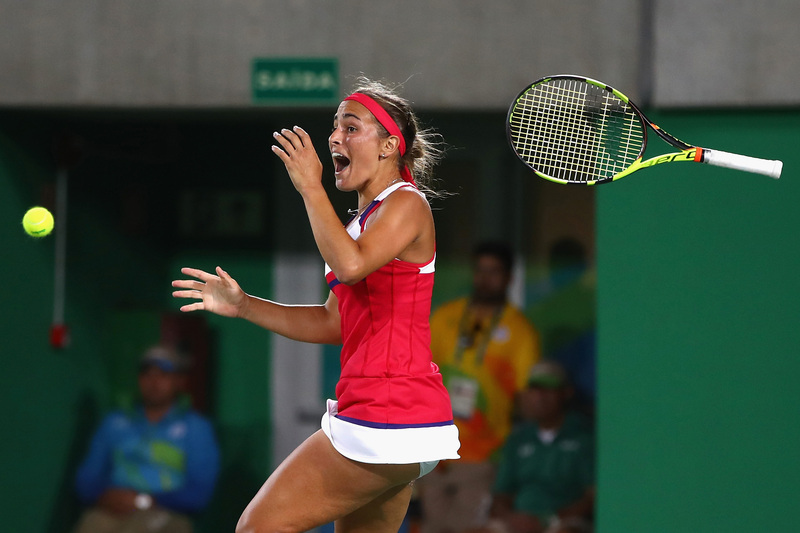 Puig came out of nowhere to win Puerto Rico's first–ever gold medal at the Olympic Games. She upset Angelique Kerber in the gold–medal match after knocking off the likes of Garbine Muguruza and Petra Kvitova earlier in the tournament. The Dartmouth graduate started Game 7 of the World Series and played a big role in ending the Cubs’ 108-year championship drought. Hendricks posted career-highs across the board. He led the National League with a 2.13 ERA as he pitched 190 innings and 170 strikeouts. He finished the year with 16 wins. His 0.98 WHIP was only behind Cy Young award winner Max Scherzer. Hendricks finished third in Cy Young Award voting. There was no sophomore slump for the former Heisman Trophy winner, as he brought the Titans within striking distance of the playoffs. Before an injury in Week 16, Mariota had surpassed last year’s stats with 25 touchdowns and 3,327 yards. Okay, not technically a play. But we had to get it on here. At age 43, Bartolo finally hit the jackpot. I’ve never even done this successfully in FIFA stoppage time. 27. How would you describe this table tennis shot? After tying the game on a field goal, the Tide pulled some trickery, took the lead soon after, and never relinquished it. Sorry this video is long and makes you click away from this site, but you totally don’t need to watch the first seven minutes of the race to figure out what happened. If you aren't a golf fan, you might have missed this. It was a cool moment. Who says Switzerland is always neutral? Not really sure what happened here, but it was a touchdown catch. ​Why is it always UConn in these multiple overtime games? Paging Jonny Flynn. There were so many ridiculous Lamar Jackson plays, it’s probably best to just pick one, on behalf of the body of work. This looked way easier than it probably was. This one gets a bump for the excellent save from Braden Holtby to start the play. Yeah, that’s about as far as anyone can run on a given football play. Selden’s excited uncle is a legend in his own right. MLB says Hamilton ran 22 miles per hour at top speed, which is pretty fast. This set the tone pretty well for how this game went, I’d say. How did that guy get that open on a play everyone knew was coming? There were plenty of huge moments during the Cubs’ title run, but this one sticks out for the high drama. Lost in the 73 wins, the playoffs, the blown 3–1 lead and the Kevin Durant saga was this piece of brilliance to cap a regular-season classic. Paul Jesperson will never buy another beer in Cedar Falls, Iowa again, and not just because there’s most likely only one bar in Cedar Falls. Any other year, this eventual game winner probably would have been higher on the list. Football. The Packers lost this game. No explanation needed. The routine nature of the play keeps it slightly behind some others, but the significance is far from lost. 4. Messi’s ridiculous free-kick goal against the U.S. Conceding this swerving, shocking, screaming dagger of a goal seems representative of the year 2016 for both the U.S. men's national team and the United States. Wearing Fernandez’s jersey, the light-hitting Gordon led off the first game since the pitcher’s death with a rare home run. Maybe the most emotional, devastating and beautiful sports moment I’ve ever seen. This could very well be LeBron’s Jordan-over-Russell moment. Exactly how they drew it up.